We will cruise towards Pauillac. Join us for on an excursion for both packages: Helicopter ride - fly over the gorgeous Médoc! Experience a bird's eye view of the numerous châteaux and famous vineyards that give the region its reputation. It's a once in a lifetime experience! **Unavailble from April to the end of June. 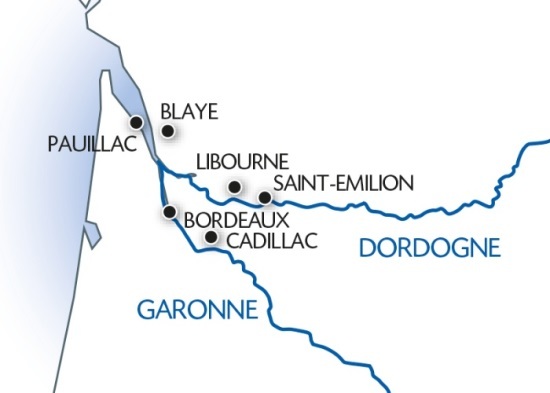 We'll begin to cruise early this morning along the Dordogne River towards Libourne. Upon arrival, join us for an excursion for both packages: tour of Saint-Emilion. Enjoy an evening of entertainment. Join us on an excursion for both packages in the heart of the Arcachon Bay. We'll return to Bordeaux at the end of the day. Enjoy an evening of entertainment.